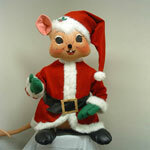 Annalee Doll Description: Imagine this huge Christmas Santa Mouse helping his companion 969906, the 6 Foot Santa holding a burlap sack of toys. Box size is 52" x 25" x 26". Wooden base and pole, stands 52" on the base. A rare opportunity for all of you mouse lovers! All orders will be shipped via Fed-Ex. Doll will ship in its own box and must be ordered separately. Annalee Doll Description: Last one. Open eyes, closed mouth with two teeth, red flannel outfit, holds brown burlap sack, green boots. Companion is C196-77. Annalee Doll Description: Last one. Facial expressions as shown, red flannel outfits, green boots, brown burlap sack and muff. This is out of my personal collection. Annalee Doll Description: Last one. Both have closed eyes, closed mouths, red flannel outfits. Santa Mouse holds brown burlap sack accented with the "Winter Bloom" fabric patch, Mrs Santa hold white fur muff, both have green boots. Very slight fading on the fronts on both of them. It looks like they might have been stored face up where the sun could have hit them. Still display great, but wanted to mention it. They are super clean otherwise. Annalee Doll Description: Last one. Facial expressions as shown, red flannel outfits, green boots, brown burlap sack and muff. Signed by Annalee in 1993 on the back of the neck and hat. Annalee Doll Description: Last one. Closed eyes, closed mouth, red flannel outfit, holds muff, green boots. Has green staining on back of leg where the green boots must have gotten wet and the green ran onto the back of her grey leg. Companion is C195. Annalee Doll Description: Last one. Open eyes, ooh mouth, red flannel outfit, holds muff, green boots. Companion is C195. White fur trim has discoloration, everything else is fine. Annalee Doll Description: Last one. Open eyes, closed mouth smile with tooth - as shown, red flannel outfit, holds muff, green boots. Companion is C195. Slight fading on top of red hood. The rest of the doll is fine. Doll may be folded to save on shipping. Annalee Doll Description: Open eyes, closed mouth, red flannel outfit, holds candle. Annalee Doll Description: Last one. Open eyes, ooh mouth, grey body, black hair, red hat and scarf, green jacket, red and white check vest, holds "Merry Christmas" sheet music. Very hard to find in this condition. Annalee Doll Description: Open eyes, ooh mouth, grey body, black hair, red hat and scarf, green jacket, red and white check vest, holds "Merry Christmas" sheet music. Very slight marbling/mottling on jacket. One tear and a few creases in paperwork, otherwise mint. Annalee Doll Description: Open eyes, ooh mouth, grey body, black hair, red hat and scarf, green jacket, red and white check vest, holds "Merry Christmas" sheet music. VERY slight marbling/mottling on jacket. Annalee Doll Description: Open eyes, ooh mouth, grey body, black hair, red hat and scarf, green jacket, red and white check vest, holds "Merry Christmas" sheet music. Very slight marbling/mottling on jacket. Paperwork has been replaced. Light stain on tail.